- The status text has been moved below the function buttons. 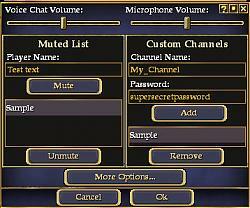 - The "Volume" label has been removed, since it's pretty obvious that it's a volume slider. - The window title (which shows the number of users in the channel) and the "Window Settings" and "Close Window" buttons have been moved inside the window frame, above the channel dropdown menu. - The window has been rearranged to take up less screen real-estate. - The fonts have been tweaked so that they reflect your font preferences in the Options window rather than being hard-coded to a specific font. - Added a "Close" button (actually, I just made the one they'd hidden visible). 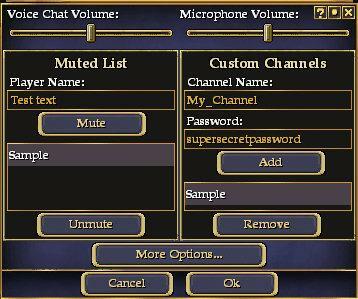 This mod works exactly the same as the default voice chat windows, except being a bit prettier and more space-efficient. 2. If the "Window Settings" and "Close Window" buttons are not visible when you login for the first time using this mod, you should right-click on the window and choose "Window Settings." Click the "Default Opacities" button until all window elements are visible.